BECKETT BASKETBALL CARD PRICE GUIDE MAY 2019 STEPH CURRY - ANYONE ? Lot Of 8 Vintage Beckett Basketball Price Guide Issues . Shipped with USPS First Class Package. Lot of (6) Shaq Shaquille O'Neal - Beckett Basketball Monthly Price Guide Collector Magazines. This lot consists of the following Issue #45 Apr 1994 Cover - Shaquille O'Neal. Issue #50 Sep 1994 Cover - Shaquille O'Neal. Beckett Basketball Price Guide April 2019 James Harden LIGHTLY USED. Shipped with USPS First Class Package. The magazine is in decent sharp! The front cover shows little wear. Shawn Kemp is on the back cover. Beckett Basketball Card Price Guide #7 - 390 pages in excellent shape. July/August 1990 Beckett Basketball Magazine #3 with Magic Johnson of the Los Angeles Lakers on the front cover and Kevin Johnson of the Phoenix Suns on the back cover. It contains an extensive Michael Jordan feature along with photos, text and basketball card prices. I am the original owner who has carefully stored this in a clear plastic sleeve. Yes, I will gladly combine shipping on multiple auctions $1 for each extra item. I carefully pack each item. Shipping tracking is included. I only ship in the Continental United States. If you have any questions, please don't hesitate to contact me. In nice condition with normal wear from a magazine that old. See photos. Lot of 9 Rare Beckett Basketball Price guide Magazines. Shipped with USPS First Class Package. Beckett Basketball Monthly Price Guide! Aug 1993 Shaquille O'Neal! US and PayPal Only Shipping will be USPS first class package or parcel post. Item will ship in 1-business day with Tracking. All clothing is inspected for stains, rips, and defects. Anything noted will be described in the listing. Beckett basketball card price guide Latrell Sprewell December 1994 Comes with protective sleeve. Mint condition. Free shipping. Gif" border="0"&amp;amp;gt;&amp;amp;lt;/a&amp;amp;gt;Magic Johnson-Charles Barkley-Kenny Smith Beckett Basketball May 2007Magic Johnson-Charles Barkley-Kenny Smith Beckett Basketball May 2007Magic Johnson-Charles Barkley-Kenny Smith Beckett Basketball May 2007. Beckett basketball card price guide Hakeem Olajuwon 1994 Comes with protective sleeve. Mint condition. Free shipping. The item pictured is the item you will receive. Beckett Basketball Monthly April 1996 Issue #69. Magic’s Show on cover featuring Hall of Famers Magic Johnson, Michael Jordan, Dennis Rodman. Great condition! Free shipping for your convenience. Will be shipped in a protective sleeve with cardboard backing. September/October 1990 Charles Barkley Basketball Beckett Price Guide Issue #4. This price guide is in very good condition with a couple minor flaws, but other than that it is a great collectable. All you Charles Barkley fans out there better not miss out on this opportunity to own a piece of basketball history. See pctures for more details on the quality of this item. This is the premier issue for Beckett Basketball. There is a nice photo of Kareem Abdul Jabbar and Julius Erving. It is in excellent shape. There is no writing or markings on the pages. Old Beckett's are a nice collectible mainly due to the great photo of the cover athlete. Beckett basketball card price guide Scottie pippen June 1994 Comes with protective sleeve. Mint condition. Free shipping. Beckett basketball card price guide Reggie Miller November 1994 Comes with protective sleeve. Mint condition. Free shipping. Beckett basketball card price guide Chris Webber July 1994 Comes with protective sleeve. Mint condition. Free shipping. More are being added each week. Beckett basketball card price guide Shaquille O’Neal September 1994 Comes with protective sleeve. Mint condition. Free shipping. 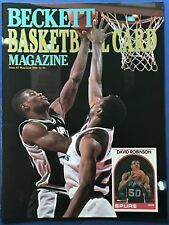 DAVID ROBINSON SAN ANTONIO SPURS BECKETT BASKETBALL CARD MONTHLY ISSUE #2 MAY / JUNE 1990. (Not to exceed 4 lbs). CLASSIC COVER, GREAT PICTURES INSIDE. Beckett basketball card price guide August 1994 Comes with protective sleeve. Mint condition. Free shipping. Be sure to add us to your. Up for sale is a lot of 10 vintage Beckett Basketball magazines. This lot includes the first 10 issues with Michael Jordan, Larry Bird, Magic Johnson, Charles Barkley, David Robinson and many others included. They are in plastic pages which they will be kept in and shipped in. The ones pictured are the ones you will receive. I will ship these for free. Payment is immediately after sale. Numbers 1, 2, and 3! Very little wear, if any.like new condition! Winner gets all 3 magazines! Like New - Direct Sales - (Have Not Been Viewed By Others). Beckett Lot 24 Magazines All in very good condition. US and PayPal Only Shipping will be USPS first class package or parcel post. Item will ship in 1-business day with Tracking. All clothing is inspected for stains, rips, and defects. Anything noted will be described in the listing. It is in excellent shape. There is no writing or markings on the pages. Old Beckett's are a nice collectible mainly due to the great photo of the cover athlete. 18 Trading Cards. If you would like any further information, feel to ask. Beckett basketball price guide First 20 Issues. All magazines are from the 1994 to 1998 era. All are in near mint to mint condition. DANNY MANNING, traded to the Atlanta Hawks, on rear cover. Very Good Condition. VINTAGE! Great for man cave! Great to FRAME and HANG! CONDITION: Normal Wear From Age & Use. (See Photos For Further Details). NOTES: Look At Pictures For Actual Condition. Good Luck! This lot consists of the following. Gif" border="0"&gt;&lt;/a&gt;Magic Johnson-Charles Barkley-Kenny Smith Beckett Basketball May 2007Magic Johnson-Charles Barkley-Kenny Smith Beckett Basketball May 2007Magic Johnson-Charles Barkley-Kenny Smith Beckett Basketball May 2007. This is the premier issue for Beckett Basketball. There is a nice photo of Kareem Abdul Jabbar and Julius Erving. Old Beckett's are a nice collectible mainly due to the great photo of the cover athlete.